Who knew that your favorite bakery treat was so easy to make? Get ready…. this is the easiest pastry ever. period. It had been a while since I had a apple turnover. Recently, I whipped up a batch one morning for a breakfast I did for my friends. I sat there wondering why I haven’t made them sooner. They come together in no time, and they simply are just delicious. 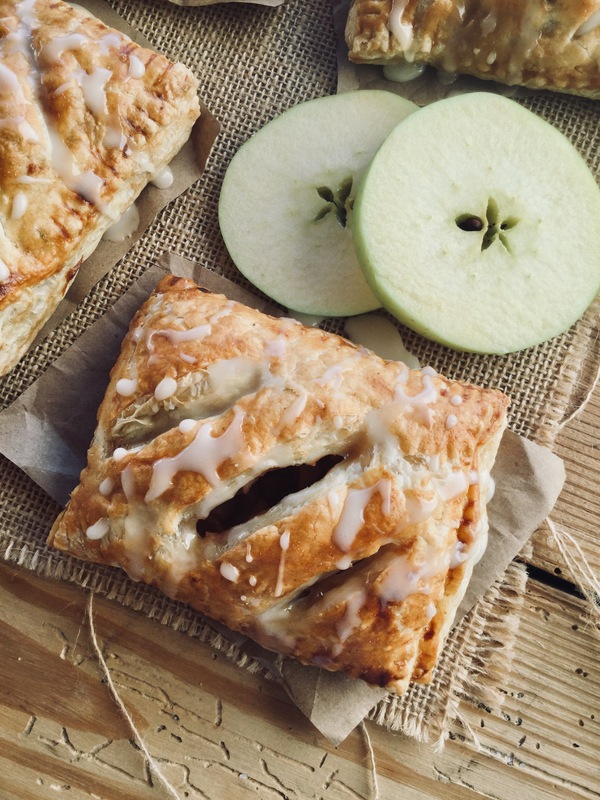 I mean seriously, how can you go wrong with puff pastry and spiced apples? 1)It’s very important to place the assembled turnovers in the freezer before baking them. Freezing them keeps the pastry super cold, which insures that the pastries will puff up and hold their shape while baking. 2)Honestly, I don’t think the kind of apple you use really matters in this recipe. I usually have Golden Delicious or Red Delicious on hand. 3)When it comes to nutmeg, freshly grated nutmeg is the best, not the already ground nutmeg in the container. I suggest getting whole nutmeg and grating it. I usually just eyeball the amount. In a medium-sized bowl combine diced apples, sugar, salt, and spices. Roll out the puff pastry onto a floured sureface. Using the scores already on the pastry as a guide, cut each sheet into 6 equal rectangles. Using a pastry brush, brush the beaten egg around the perimeter of each rectangle. Assemble the pastries on a parchment paper lined sheet pan. In the center of 6 of the rectangles place about 1 1/2 Tablespoons – 2 Tablespoons of the apple mixture. Then top with a rectangle of pastry. Seal by pressing a fork down into the pastry all the way around. Brush the tops with the rest of the egg and make 4-5 slits using a sharp knife. Pop the assembled turnovers in the freezer for about 20 minutes. Preheat oven to 400 degrees F. Once oven is preheated bake the turnovers for 30 minutes or until golden brown. Prepare the icing while the turnovers are baking. Simply whisk the icing ingredients together with a fork in a small bowl. 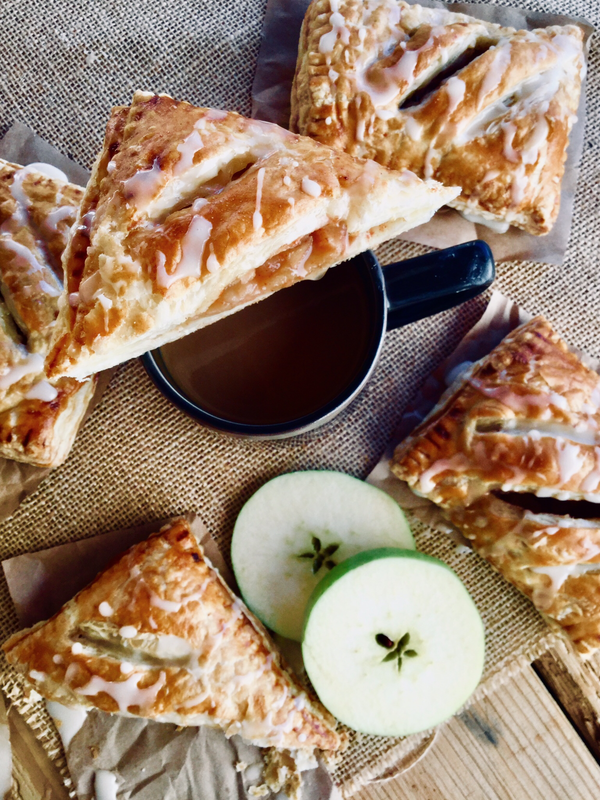 Allow the turnovers to cool slightly before icing them. Serve & Enjoy!